Over the past couple of months we have driven past the creation of a laundromat and café with interest and this morning headed over to try the breakfast and to see if it measured up and could become our Sunday morning breakfast destination. Being creatures of habit and being a bit indulgent from time to time, we both love to head out on our days off on the weekend to breakfast and enjoy reading the papers on our iPads and have good coffee and some good food. Sunday can be a bit more problematic than other days of the week because more people venture out on a Sunday for breakfast and so if you do not get in early then you can sometimes miss out on a table, but being early risers this is not usually a problem for us. It usually just involves finding somewhere that is open when we do get up and want that first coffee of the day! 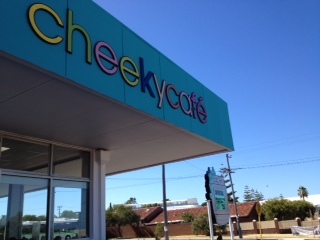 Cheeky Cafe and that attached Laundromat are situated down Scarborough Beach Road away from the beach and looms large as you approach it. It proudly offers specials for your washing on signage that tell you of the options on offer here. But once you venture inside you see that the laundromat is tucked out the back and the café itself feels just like a café and you do not really pay any attention to the laundromat. 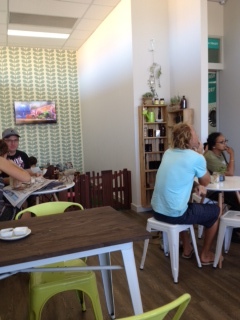 It is a great idea however and in a perfect location because there are lots of back packer accommodation and units around and so I would guess that during the week it would do great trade and the ability to do your washing and enjoy a great coffee and something to eat is a great marriage! The café seats about 40 people and there are also tables and chairs outside for some extra diners when inside gets full. Today when we arrived there were only a few people but by the time we had finished breakfast the place was nearly full. The other good thing about Cheeky is that there is a play area with a flat screen TV for kids to head to and allows parents to enjoy a coffee in relative quiet whilst the kids either watch a DVD or play with some of the toys. Inside is welcoming and there is an area just for kids! 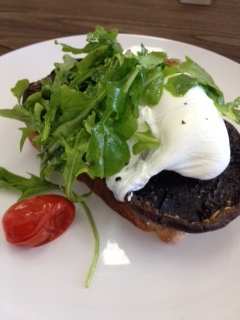 After perusing the menu we stuck with what we love for breakfast and ordered poached eggs on toast with mushrooms. After all if I am going to be consistent in my reviews for my search for the perfect breakfast spot then surely I have to have the same food each time so I can do a true comparison! At Cheeky Cafe the mugs were not large but the compromise was to get the coffee served in the large take away cup and that did the trick. They use 5 senses coffee and it was made perfectly. 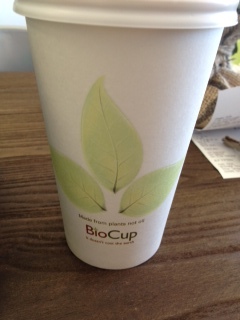 This was a great first cup of coffee for the day and served promptly by the staff to the table. The poached eggs on toast were served on a piece of delicious sour dough bread along with some wilted greens and tomatoes as well as 2 perfectly cooked field mushrooms. The tastes all blended and complimented each other. This was just delightful and served on warm plates to make sure that nothing went cold before you got to the end of the dish – I love that! The only critique I would have, and it is a minor one, is that they only served one piece of toast and I prefer to have a piece of toast for each egg but on reflection I did not leave Cheeky Cafe feeling hungry I suppose it is just that at most places it is 2 pieces of toast that you get and being a creäture of habit that is what I like. Perfect eggs and mushrooms – a real delight! But I do not want to take anything away from the food or the coffee because both were great. The coffee was perfectly blended and delicious and the food was well presented, hot and the mushrooms had a little something extra added to them to really make them taste delightful. 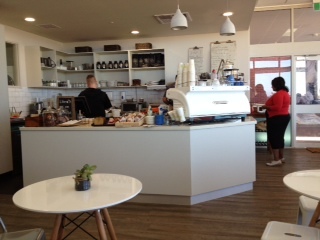 So in the end Cheeky Cafe goes on the list of places to head on a Sunday for good coffee and good food….oh and they also have free wi-fi…another big plus in my books for any new place opening these days, now if we could only get the rest of Perth to catch up with that! 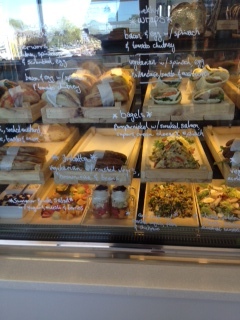 There is lots of offer here and all made in-house and fresh every day!